- UPW 5th Anniversary Show (February 20, '04) = The Outlaws (Mike & Marshall Knox & Derrick Neikirk) fell to the Havana Pitbulls (Ricky Reyes, Ricky Romero, & Puma). - DSW Debut Show (September 1, '05) = Team Elite (Knox & Derrick Neikirk) defeated Lash LeRoux & Ryan Reeves. - DSW Tag-Team Title Tournament (May '06) = Team Elite took down Danny Gimondo & Roughhouse O'Reilly, then lost to the eventual winners, High Impact. - DSW Six Flags Park Slam '06 (June 9) = Knox was beaten by Roughhouse O'Reilly. - DSW Six Flags Park Slam '06 (August 11) = Knox won over Brian Majors. - WWE Survivor Series '06 (November 26) = Knox, Gregory Helms, Johnny Nitro, & Rated RKO competed in an "Elimination" Match against D-Generation X, CM Punk, & the Hardy Boyz. Knox was eliminated by Shawn Michaels. Team DX all 'survived'. - ECW December To Dismember '06 (December 3) = Knox & Kelly Kelly fell to Kevin Thorn & Ariel. - DSW Six Flags Park Slam '07 (March 17) = Team Elite, as the DSW Tag-Team Champs, lost a "Non-Title" Match to Freakin' Deacon & G-Rilla. - WWE Royal Rumble '09 (January 25) = Knox competed in the "Royal Rumble" Match, which was won by Randy Orton. - WWE No Way Out '09 (February 15) = Knox lost an "Elimination Chamber" Match to Edge, who won the World Title. John Cena, Chris Jericho, Kane, and Rey Mysterio were the other participants. - WWE Hell In A Cell '09 (October 4) = In a dark match, Knox fell to Matt Hardy. - WWE Wrestlemania XXVI (March 28, '10) = In a dark match, Knox competed in a "Battle Royal", which was won by Yoshi Tatsu. - TNA No Surrender '12 (September 9) = The Armbreaker lost, via DQ, to Austin Aries. - TNA Bound For Glory '12 (October 14) = Aces & Eights (Mike Knox & Luke Gallows [both masked]) won a "No Disqualification" Match over Bully Ray & Sting. 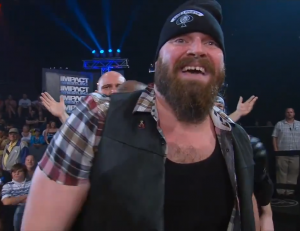 - TNA Final Resolution '12 (December 9) = Aces & Eights (Mike Knox[masked], CJ O'Doyle[masked], Brother Devon, & DOC) fell to Kurt Angle, Wes Brisco, Garett Bischoff, & Samoa Joe. - TNA Lockdown '13 (March 10) = Aces & Eights (Knux, Mr. Anderson, Garett Bischoff, Devon, & DOC) lost a "Lethal Lockdown" Match to Samoa Joe, James Storm, Eric Young, Magnus, & Sting).